New Parent Handbook and Player Bag Tags for 2011! Lacrosse lives in the pride, exhilaration and smiles of your children, and when it says US Lacrosse, you understand that your child will be playing in a program that provides a safe, fun, informative and well-coached environment. As a non-profit organization, we invest your membership fees in a range of programs designed to maintain the sports safety and fun. 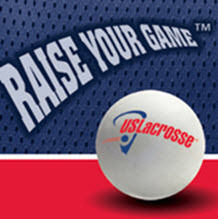 Part of our job here at US Lacrosse is to understand what information that parents are looking for to make their experience better as they do the best to support their children. Through membership research, we heard loud and clear that better understanding the rules of lacrosse and officials' hand signals was a big need. So we have developed a handbook specifically for parents that provides guiding principles for the game, a game overview, a diagram of the field and required equipment, and finally an overview of the minor and major fouls along with their hand signals. While, this Parent Handbook will arrive in the mail with your players new bag tag membership card, take a look at it now by clicking here.